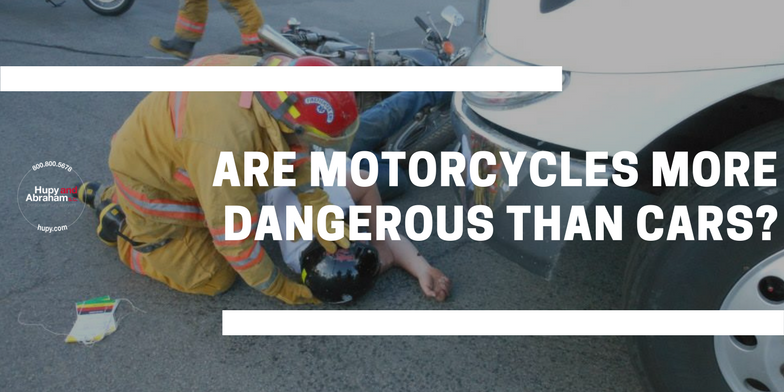 Are Motorcycles More Dangerous than Other Vehicles? | Hupy and Abraham, S.C.
Are Motorcycles More Dangerous than Other Vehicles? Findings in a study conducted in Canada were released claiming that motorcycles are more dangerous than other forms of motor vehicles and that motorcycle crashes are five times more likely to result in a fatality and health care costs are six times greater than passenger vehicles. Motorcycle accidents are far more common than car accidents, relatively speaking. There were 2,194 motorcycle injuries each year per 100,000 registered motorcycles. That’s triple the rate of automobile injury. Those injuries were far more serious. There were 125 severe injuries each year per 100,000 motorcycles, compared to just 12 severe injuries per 100,000 cars. People injured in motorcycle accidents were much more likely than those injured in car crashes to be hospitalized. They were also more likely to be admitted to the intensive care unit. Motorcycle crashes are more often deadly. There were 14 deaths per year for every 100,000 motorcycles, compared to three deaths per 100,000 cars. The mean cost of a motorcycle injury was $5,825. The mean cost of an automobile accident was $2,995. Those numbers might be underestimating the costs. The study only followed people for 30 days after they were treated for an injury, which means the numbers don’t take rehabilitation or other types of continuing care into account. The study’s authors say they hope their findings will push manufacturers and policymakers to improve motorcycle safety. A simple observation is most motorcycle crashes will result in some degree of injury, while many car crashes are property damage only. That would account for the elevated numbers of cyclists injured compared to car occupants for the same number of vehicle registrations. These numbers from Canada are similar to findings here in the U.S., although due to changes in statistical methodology prior to 2012, vehicle miles traveled (VMT) from 2012 up is considered a more reliable source for comparison analysis than the number of vehicle registrations. The Canada study questions what can be done to make motorcycles safer. There already have been huge improvements in road engineering techniques to reduce the number of potential crashes. Vehicle engineering in passenger vehicles has also been improving in designs of seat belts, safety glass, air bags, traction control and braking systems. The motorcycle industry has tried to implement improvements with anti-lock brake systems, balance system integration, and new technology in tires. More work needs to be done, but there are limitations to what can be added to make motorcycles safer to operate. Some observers claim motorcycle rider courses are the most effective way to reduce crashes, but that claim isn’t substantiated by the statistics. Certainly, beginner rider courses followed by continued advanced and refresher courses make you a better rider, but not necessarily a safer rider. Riding a motorcycle is a dangerous activity. If you think otherwise, you’re fooling yourself. That doesn’t mean we should ban motorcycles, but it does lend to the argument that changes should be considered in how training is conducted and how endorsements are achieved. It is also important to realize that the National Highway Traffic Safety Administration (NHTSA) has a combined list of types that define “motorcycle.” They are all included in the statistic totals when looking at motorcycle crashes, fatalities and injuries. 88; other motored cycle (mini-bike, motor scooter, pocket bike). How does this effect statistics? In 2016, there were 5,283 motorcycle fatalities reported. According to this chart, 680 additional fatalities were reported as “motorcycle” using the NHTSA definitioin of what a motorcycle is. The Federal Analysis Reporting System (FARS) uses NHTSA’s definition of motorcycle when compiling these crash numbers. Despite your political or personal views on motorcycle deaths, it’s irrefutable that motorcycles are over represented in vehicle crashes, whether using total registrations or vehicle miles traveled as a study marker. More has to be done to reduce these crashes, whether it is better training and stricter requirements to attain motorcycle license endorsements, improved roadway and vehicle safety engineering, more share the road training for passenger vehicle and commercial drivers, and changing the beliefs and behaviors of all roadway users concerning alcohol use and excessive speed. Another looming concern is the introduction of autonomous vehicles on tomorrow's roadways. Obstacle detection systems in these vehicles must be sensitive enough to recognize motorcycles, bicycles, pedestrians, animals and debris as well as other vehicles in order to be safe. You can read more about the Canadian study here. For a different look at where we should be going with motorcycle training, visit the National Motorcycle Institute’s pages. If you've been injured in a motorcycle accident you need to speak with an experienced motorcycle injury attorney as soon as possible. Please contact us online or call us directly at 800.800.5678 to schedule your free consultation.